This is one of those games you forget about quickly lest ye lose focus on the matter at hand. But it flashes through your mind just as quickly in that late-September moment when you realize you're going to miss out on the promised land of October in San Francisco by one or two games. This game was ours. We should have owned it for nine innings. Instead, we sub-leased it to a surrogate team for the final two. They're a scrappy bunch, the Redlegs, and they've been suffering, and you never want to awaken a scrappy team, especially in the first game of a series. 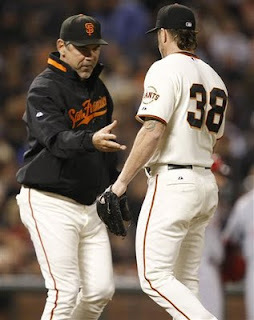 The way we look at it, Brian Wilson and the bullpen just gave up the ghost. The way Reds fans they look at it, they just beat Tim Lincecum. Did I mention the Hated Ones blew a ninth-inning lead and lost in extras? This could have been moving day. It should have been moving day. Instead, we're back into a tie with the Rocks — who just won't go away — and still staring at a 6 1/2 game deficit in the West. Stay hot, "Gino" Velez. (Thanks to Mychael Urban for the nickname.) 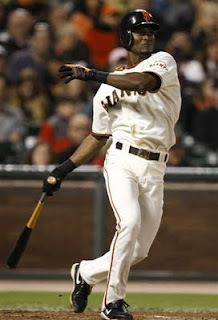 The bat speed he displayed on that lawn dart of a round-tripper made me think of Barry Bonds... circa 1987. Bengie Molina just missed a big night, hitting three balls that would've been out of a lot of parks. Fortunately, one of them managed to scrape the fence and get out of ours. 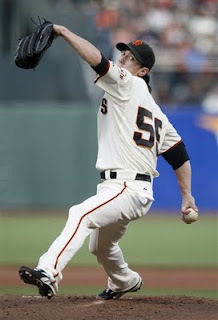 Tim Lincecum continues to impress. Even without his best stuff, he bends but does not break. Rolen's double was the only decent hit the Reds got off of him. He didn't have the strikeout touch, but Matt Cain's resurgence should have proven by now that pitching works just as well as throwing. How in the name of everything holy did the Reds score five runs in the ninth inning while hitting only one ball out of the infield?! Bonus question: Did anyone else hear circus music in the back of their mind while watching that agonizing display of mediocrity? Nice recovery, boys. That's a sign of a winning team if I ever saw one. But if this keeps up, we may have to rename the site "Unicorn Lovefest." With Timmy and Matty topping off a four-man rotation and Barry Z mixed in between, we're talking a lethal three-man punch in a playoff series. I'm just sayin', and I'm not the only one. Btw, stay f**king hot, "Ricky" Velez — thanks to Baggs for another new nickname. The same goes for Bengie "Molasses" Molina, the new rising star of the Giants offense — and a three-year vet of my fantasy team. Imagine if he'd been hitting like this since May. Unfortunately for the naysayers, looks like his recent run is re-cementing his spot in the cleanup role. I'll just say this about Fox's exclusive rights to Saturday afternoon: %$#@*! That said, it was a wonderful opportunity to rediscover the beauty of baseball on the radio. I feel like I saw the game without seeing a pitch, and that's due to the fine work of the Giants broadcast crew. 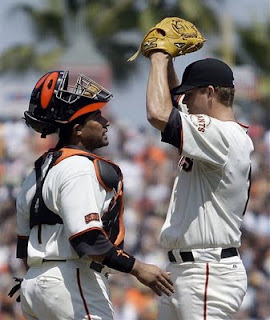 Jeremy Affeldt picked up his 24th hold, good enough for second in the majors just behind the Cubs' Carlos Marmol (25). 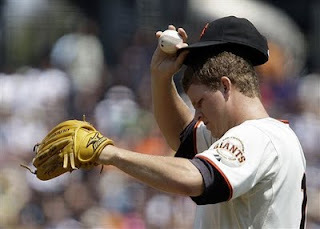 Once again, Matt Cain is done in by a bomb and a blast. Add that to a weak offensive display against a struggling starter, and you've got one of the most embarrassing series defeats of the season, right up there with getting swept by the Los Angeles Angels of Anaheim near the airport by Disneyland. At least the Halos are a decent team — a division leader at that. Dusty's squad hadn't won a series since the first week of July and hadn't won one on the road since mid-June. Silver lining: Rowand made a great play before tweaking a hammy and — in a shocking move — allowing himself to be pulled from the game lest the injury worsen. Perhaps he's finally beginning to understand the limits of the human body. I'm sure his family appreciates that. Why pitchers want to play in San Francisco, Reason 976: The two dingers allowed by Matt Cain matched the number of homers he'd surrendered in his previous seven home starts. Yes, they're only 5 1/2 games behind the struggling Dodgers, who are under .500 since the All-Star break. Yes, they're tied for the lead in the Wild Card "Division". 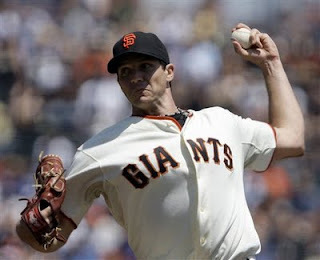 Yes, Barry Zito continues to look, well, solid. (Hey, it's a start.) But for only the second time this season, the Giants lost games started by Tim Lincecum and Matt Cain in the same rotation cycle. The other time was during a certain forgettable six-game Southern California roadtrip coming off the first week of the season. Our G-Men dropped six straight in San Diego and L.A., and put a permanent kink in their quest for a Western Division title. If they'd gone 3-3 on thaty trip — with two of those wins at Chavez Ravine — the Giants would be facing a 2 1/2 game deficit in the West. Okay, so maybe some of the guys were caught looking ahead to the series with the Hated Ones beginning tonight. Can't say that I blame them. With the series in our house and the Hated Ones on a sour stretch, this is gonna be a huge set of games.